We’ve got two new books available in the store! First up, The Art of Kaneoya Sachiko! This long-awaited title is a 224-page, full color art book, and the first English-language collection of the artist’s work. The physical edition is a high-quality coffee-table book, with multiple cover enhancements and a special edge treatment on its pages. 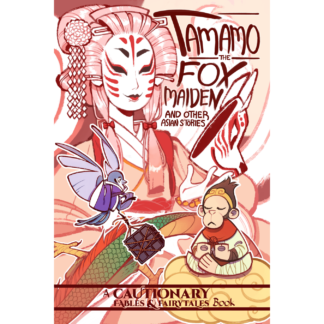 Second, we’ve got the latest volume of the Cautionary Fables & Fairy Tales series, Tamamo the Fox Maiden! Following up The Girl Who Married a Skull, Tamamo features 21 different all-ages stories of myth and folklore from Asia. Want us to send you newsletters? Don't worry. We promise not to sell your information or anything. We're not creeps. Check out the latest Iron Circus releases! "Dirty Old Ladies is a podcast hosted by Iron Circus Comics founder C. Spike Trotman, and cartoonists Kel McDonald and Amanda Lafrenais. Comics industry insider talk with three life-long professionals! Wanna be published by Iron Circus?